Mr. Scatter has never been able to talk Mrs. Scatter into chucking it all and building a little log cabin in the woods. And, truth to tell, he’s not all that good at the log-splitting thing. Plus, there’s the indoor-plumbing issue: In general, he’s in favor of it. Still, he’s fascinated by the rustic stick constructions of North Carolina-based artist Patrick Dougherty — so much so that he wrote in this recent post about one that Dougherty built in Ketchum, Idaho. So he highly recommends Penelope Green’s lavishly illustrated story Of Sticks and Stones in Thursday’s New York Times, about Dougherty’s little-cabin-that-grew that he shares, during his rare down times, with his teenage son and museum-curator wife. Old and new meet both in Dougherty’s North Carolina compound and the stick sculptures he’s installed worldwide: they speak to something arduous, provisional and soothing in humans’ relationship to the natural world. We could all use a dose of Dougherty’s soothing sticks after taking in the next couple of recommendations. Both stories depress and exasperate and anger Mr. Scatter. Yet he still considers them must-reads. The first: Steve Duin’s maddeningly excellent column in Thursday’s Oregonian, Terrified of an unguarded moment, about how today’s politicians are increasingly ducking even the most facile of encounters with reporters, which means, essentially, that they want nothing to do with anything resembling a give-and-take with the public they supposedly are vying to serve. Duin’s immediate case in point is Oregon’s two major-party gubernatorial candidates, John Kitzhaber and Chris Dudley, although he makes clear they’re far from the only ones playing this little game. Everything’s scripted, everyone’s handled, nothing’s real. Is it arrogance, or fear? Or is it just that, in a climate where money pours in very big buckets, the sort of ordinary voters who reporters work for just don’t count? The second: David Carr’s morbidly fascinating report At Sam Zell’s Tribune, Tales of a Bankrupt Culture in Wednesday’s Times. If true — and it smells right — it’s a shocking if weirdly unsurprising tale of the arrogance, hubris and venality driving far too much of the contemporary corporate world, in which a small group of top-management Visigoths feed at the trough while disdaining not just the common good but also the future and stability of their own organization. That all of this has happened in Mr. Scatter’s own industry — the Tribune Company publishes such once-great newspapers as the Chicago Tribune, Los Angeles Times and Baltimore Sun — only angers him more deeply. Put together the arrogance of our corporations and the isolated, money-baggish timidity of our political leaders, and maybe Mr. and Mrs. Scatter will build that cabin in the woods, after all. Can’t be that hard. Right? 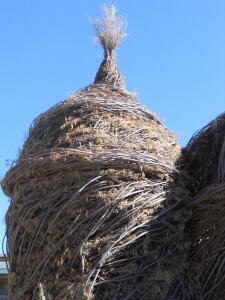 PHOTO: The dome of Patrick Dougherty’s stick-structure in Ketchum, Idaho.